Although Kamus + Keller specializes in the planning, selection and design of new offices, we’re not immune to the ups and downs of the relocation process. With only five weeks to go until the move of our Long Beach office, we’re busy cleaning, discarding, shopping, selecting furniture and finishes, and giddily daydreaming of our sleek new space with incredible views. Leading up to that time, we’ll be sharing some thoughts and pictures on our process and progress. Read our first article with David Keller here. 1. While office shopping, were you hoping for a space with pre-determined areas for everything, or one that was wide open for us to build-to-suit? I think we were definitely looking for something build-to-suit, that way we could create our vision from scratch. But interestingly enough, we ended up with the opposite! We had in mind a build-to-suit, creative, stand-alone building, not a high-rise – that’s the vision David [Keller] had for the past 10 years. We turned down looking at this space a couple times, but finally went to look at it and instantly fell in love with the possibilities of what it could become. 2. What are the key elements to a good space plan design? Obviously function – doing something creative and way outside-the-box is always fun to think about, but most importantly it has to fit within your business model. If it doesn’t function, as creative and cool as it may be, it’s really unusable real estate you’re paying for. So a good space plan is a combination of all those factors: functionality, creativity, usefulness, as well as what makes your people happy. 3. 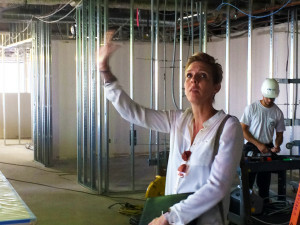 What were the biggest challenges in space planning our new office? Keeping in mind what the budget was, and space planning for our needs to fit within that. And we found a space that was built-out with 85% of things we were going to keep, so trying to rework that to make it fit for us was also challenging. 4. We all know it’s not possible to make your entire staff happy with every decision. How do you juggle the demands of all the differing personalities and requests? [Laughs] Yeah, that’s definitely a challenge. It’s funny: we tell our clients when they talk about building a design team within their office to look at finishes or space planning, we encourage them to keep that team small because the more people you bring in, the more personalities you have to deal with. No one ever agrees 100% on everything, and that’s the same thing within our office. We wanted everyone to be involved and have some say-so, but at the same time, with everyone’s personalities being so different – “We want a library” vs. “We don’t need a library”; or “We want gray”, “No, we want green!” – nothing really works out [easily]. So, I think we just tried to take the best [ideas] from everybody, while being clear that the vision of Kamus + Keller will be showcased, and to trust that the final decisions made will be the best for the business. 5. What’s your best advice to companies in regards to successful space planning? I know this for a fact, from our experience [shopping for this new office], and from people who do the opposite: get the space planner involved as early as possible. Even if you haven’t found a building, bring your space planner with you to tour buildings, because I’m telling you: there are things that we saw when we were searching for a building that if our broker had just sent us there and we didn’t know what was within the space, it would’ve been a nightmare. Getting experts involved upfront is just incredibly important.